The versatility of gold chains has yet to be matched. Ideal as a subtle accent to an outfit or perfect as a centerpiece, our extensive range of styles patterns and gold chain variants are essential additions to any jewelry collection. 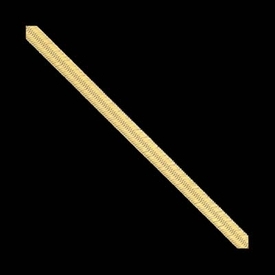 14K Yellow gold Figaro Chain 3mm Wide and 1mm thick. An attractive chain for anytime. This chain ends with a lobster claw clasp. Available in 4 lengths, 16, 18, 20, and 24 inch. 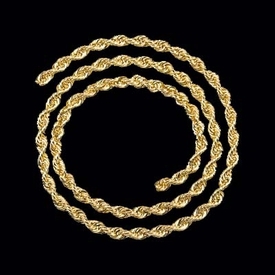 Figaro Gold 5mm chain. 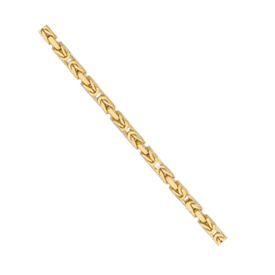 This 14k yellow gold version of the classic Figaro chain is available in a variety of lengths including bracelet. We've listed weight for the lengths in a table below. Classic styling Figaro is great to wear alone of with a large pendant. Chain is secured with a lobster clasp. Gorgeous 14k gold hand polished flat beveled curb chain, price shown for the 9.8mm wide 8 inch bracelet length. This chain is a casted design and features a heavy duty box clasp with safety catch. Our 8" bracelet weighs aprox. 48grams. Use the drop down menu to order alternate lengths. Special order in 14k White or Rose gold or 18K gold options. 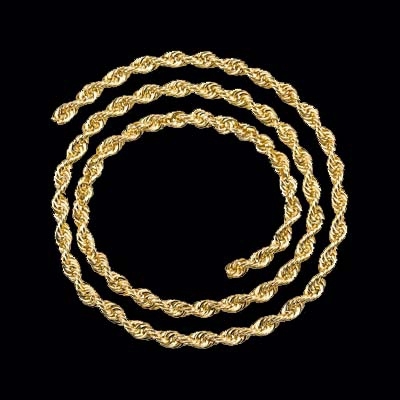 A Gorgeous Classic, 14K Gold 6.5mm Wide Figaro Chain. Available in a variety of lengths including bracelet lengths. Price shown is for the 7 inch bracelet. The Figaro is a true classic. Imagine this beautiful 14K Gold on you, can you see it? Custom lengths available simply email for pricing. We have listed some of the most popular chain length options. Handmade 14k Yellow gold regular rope chain. Skillfully handwoven and soldered chain in a classic rope design is available in a large variety of widths and lengths starting with a solid 1.50mm up to a 6mm width. Very durable chain, great pendant chain. Each selection features a lobster claw clasp. Example gram weight 18" 1.50 mm 3.65gram. 14K White or Yellow Gold Diamond Cut Wheat Chain. This wheat chain measures 2.75mm in width and is readily available in a 16", 18", and 24" length. Custom order any length, email for pricing. Elongated woven wire forms an excellent pendant chain. Wear this chain alone or with a charm, pendant, even chain slide. Gorgeous 14k Yellow gold Beveled curb chain. 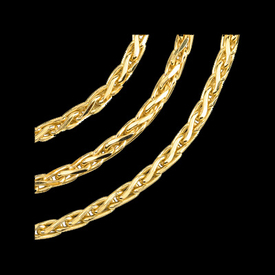 This chain design is available in a large variety of widths and lengths. Price shown is for the 8mm wide 20" long neck chain weighing aprox. 51.12 grams. Polished finish and secured with a lobster clasp, this is an incredible chain. Use our drop down menu to order this great design in additional lengths. 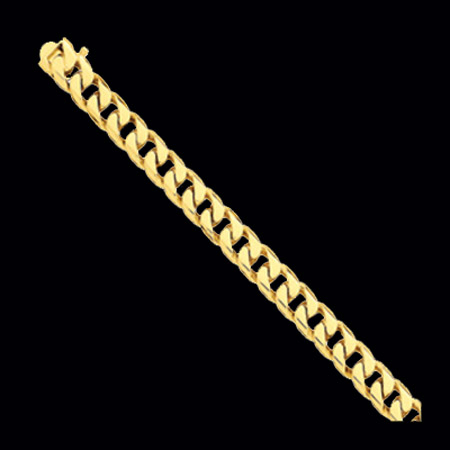 14K Gold Byzantine Chain available in a large variety of Widths and Lengths. The Byzantine Chain is intricately designed, a Lovely chain. This is a Heavy Chain, square design. Widths starting at 2mm up to a 6.5mm. The byzantine chain is very durable and a great pendant chain or wear alone. Price shown is for the 2mm 16" length chain weighing 10.4grams. Heavy 14k White Gold Figaro Chain. Our classic Figaro chain in 14k white gold measures 7mm wide, is Hand Polished, and available in a variety of lengths. Price shown is for the 18 inch length. This chain is made in the United States. Gram weight for the 18 inch length is about 48.10 grams. Secured with a quality lobster claw clasp.